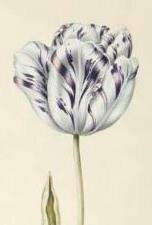 Note: At the time of Tulipmania, there were approximately 60 tulip cultivars that had the appellation of �admirael.� Following are several �admirals� for which we have illustrations. All are interfiled regardless of spellings, which includes �admeraal, admerael, admiral, admirael, ameral�, and other variations. Thereafter, for names that begin with prefixes � e.g., da, de, der, van, van der, etc., the prefixes are ignored, and the entry is filed after the portion of the name that follows. Thus �Admiral van der Eyck� is filled alphabetically as �Admirael Eyck�. �Admiral� was the most prized and prestigious name a tulip could have � denoting (and in some cases exaggerating) their great beauty. However it also generally referred to flowers that were shades of red and pink on a white ground � a category of �broken� tulips known both then and today as �roses�. Many �roses� had names that did not start with �admiral�, and some �admirals� were not �roses� � but most �admirals� were �roses�. Most of these tulips were Single Lates, although a few were Single Earlies. Image 20 in the P. Cos Tulip Book. Click image for a larger version. Image 41 in the NEHA Tulip Book. Click image for a larger version. Image 50 in the NEHA Tulip Book. Click image for a larger version. Image 35 in the P. Cos Tulip Book. Click image for a larger version. Image 7 in the NEHA Tulip Book. Click image for a larger version. Image 47 in the NEHA Tulip Book. Click image for a larger version. Image (34 or 39?) from The Great Tulip Book, which is in the collection of the Norton Simon Museum. Clicking the image or the name above will take you to this image at the Norton Simon Museum Store, where it can be enlarged and seen in considerable detail. Image 51 in the P. Cos Tulip Book. Click image for a larger version. [Admiral] Van der Eyck Tulip. Image 33 in the NEHA Tulip Book. Click image for a larger version. Image 34 in the NEHA Tulip Book. Click image for a larger version. de Admirael Van [der] Eyck Tulip. Image 52 in the NEHA Tulip Book. Click image for a larger version. Admiral Verijck (van der Eijck) Tulip. Image 7 in the P. Cos Tulip Book. Click image for a larger version. Image 17 in the NEHA Tulip Book. Click image for a larger version. Image 23 in the P. Cos Tulip Book. Click image for a larger version. Image 17 in the P. Cos Tulip Book. Click image for a larger version. This work was sold at Sothebys. The corresponding image consists of two tulips, Admirael Golsien being the tulip on the left. Provenance not yet identified. Image 59 in the NEHA Tulip Book. Click image for a larger version. Image 47 in the P. Cos Tulip Book. Click image for a larger version. This work was sold at Sothebys. The corresponding image consists of three tulips, Admirael Latour being the tulip at the far right. Provenance not yet identified. Image 15 in the P. Cos Tulip Book. Click image for a larger version. Image 44 in the P. Cos Tulip Book. Click image for a larger version. de geele Admiral De Man Tulip. Image 51 in the NEHA Tulip Book. Click image for a larger version. This tulip was named for the tulip grower and breeder, Henrik Pottebacker, who developed the initial broken �Rose� tulip. This tulip, Admirael Pottenbacker, is a �Rose� tulip. Pottenbacker was from Gouda. See also the tulips that contain the name �Gouda�. This work was sold at Sothebys. The corresponding image consists of three tulips, Admirael Pottenbacker being the tulip at the far left. Provenance not yet identified. This work was sold at Sothebys. The corresponding image consists of five tulips, Admirael Pottenbacker being the first image (farthest to the left). Provenance not yet identified. Admirael Pottervbacker Tulip, with Isabelle Tulip and Swallowtail Butterfly. . This work was sold at Sothebys. Provenance not yet identified. This image illustrates the great difficulty in trying to identify old tulips from drawings and paintings. Both these tulips appear to be broken �roses�, and it is not possible with certainty to determine which is Isabelle and which is Admirael Pottenbacker. See and compare to the separate images of Admirael Pottenbacker Tulip and the Isabelle Tulip. Image 20 in the NEHA Tulip Book. Click image for a larger version. Image 14 in the P. Cos Tulip Book. Click image for a larger version. de vice Admirael Tol Tulip. Image 56 in the NEHA Tulip Book. Click image for a larger version. Image 57 in the NEHA Tulip Book. Click image for a larger version. Image 58 in the NEHA Tulip Book. Click image for a larger version. Admirael der Admiraelen de Gouda Tulip.. Image (5?) from The Great Tulip Book, which is in the collection of the Norton Simon Museum. Clicking the image or the name above will take you to this image at the Norton Simon Museum Store, where it can be enlarged and seen in considerable detail. This work was sold at Sothebys. The corresponding image consists of three tulips, Anvers being the middle tulip. Provenance not yet identified. Image 45 in the P. Cos Tulip Book. Click image for a larger version. Image 65 in the P. Cos Tulip Book. Click image for a larger version. Image 22 in the NEHA Tulip Book. Click image for a larger version. Tulp uit saet of bellert Tulip. Image 3 in the P. Cos Tulip Book. Click image for a larger version. Note: This tulip probably is named for Cornelis van Blijenburgh, a collector of shells as well as tulips, valuing them both as beautiful examples of God�s creation, and in the latter case, also his own. Image 25 in the NEHA Tulip Book. Click image for a larger version. Image 24 in the P. Cos Tulip Book. Click image for a larger version. �De vroege� means �early�, and �de laatste� means �the last�. 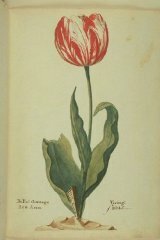 Old manuscript catalogs include several Blijenburger Early tulip varieties (e.g., Blijenburgher, vroege; Blijenburgher, vroege Catolijn; Blijenburgher, vroege da Costa; Blijenburgher, vroege de Goyer; and Blijenburgher, vroege Melemans) and at least eight catalogs include a Blijenburgher Late. However, only a sinlge flower image appears here. Because a single tulip cultivar does not bloom both �early� and �late� (and that would have been spelled 'laate', but wasn�t) � and because there are three of these designations, which correspond with three sets of weights and prices recorded in the image, possibly it is the corresponding weight and price that are being referenced. In any event, it is not certain what cultivar this image represents other than it�s a Blijenburgher. Compare with Blijenburger Voege, which follows. �Blijenburgher� has an interesting connoation with respect to this tulip name. �Burg(h)er� means 'citizen,' originally 'town-dweller� (singular). �Blii� has a meaning similar to �happy� or �glad�. Thus, the tulip name could be roughly translated as �Happy (Town) Person� or �Glad Person' or �Glad Citizen� or maybe even �Gladdens the Person.' Indeed, Cornelis van Blijenburgh would have been a rejoicing and thankful person to have it in his collection. Image 37 in the P. Cos Tulip Book. Click image for a larger version. Image 31 in the P. Cos Tulip Book. Click image for a larger version. Image 13 in the NEHA Tulip Book. Click image for a larger version. Image 11 in the P. Cos Tulip Book. Click image for a larger version. Image 6 in the NEHA Tulip Book. Click image for a larger version. Image 30 in the P. Cos Tulip Book. Click image for a larger version. Image (23?) from The Great Tulip Book, which is in the collection of the Norton Simon Museum. Clicking the image or the name above will take you to this image at the Norton Simon Museum Store, where it can be enlarged and seen in considerable detail. Image 32 in the P. Cos Tulip Book. Click image for a larger version. Bruyn Purper Schilperoort Tulip (also known as Ghemarmerde van Kaer Tulip; an early Violet/Bybloemen). Image 54 in the P. Cos Tulip Book. Click image for a larger version. de gemeente Burgemeester Tulip . Image 55 in the NEHA Tulip Book. Click image for a larger version.